Take a look at our amazing collection of Indian kitchen design that are highly functional and efficient in style. Kitchens are seasoned with love. Great meals have a way of bringing family and friends together in a special manner. There is nothing like sitting around with friends having great conversations over a delicious meal. 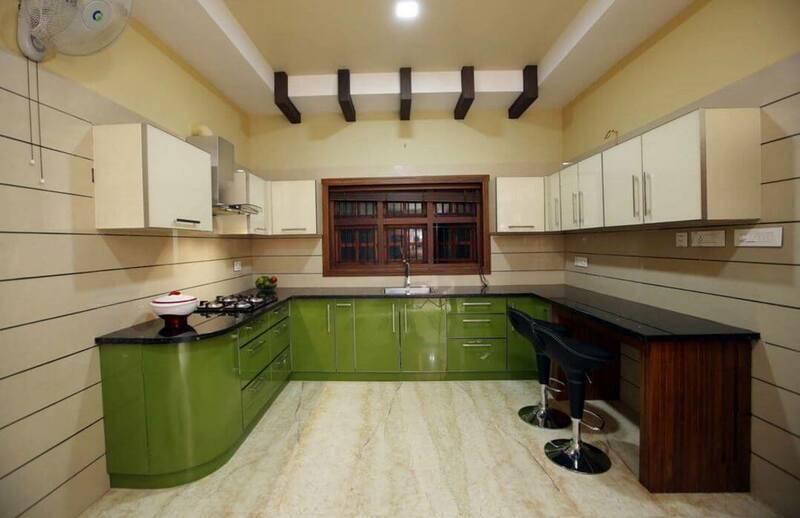 Here are beautiful Indian kitchen design ideas for your lovely home. 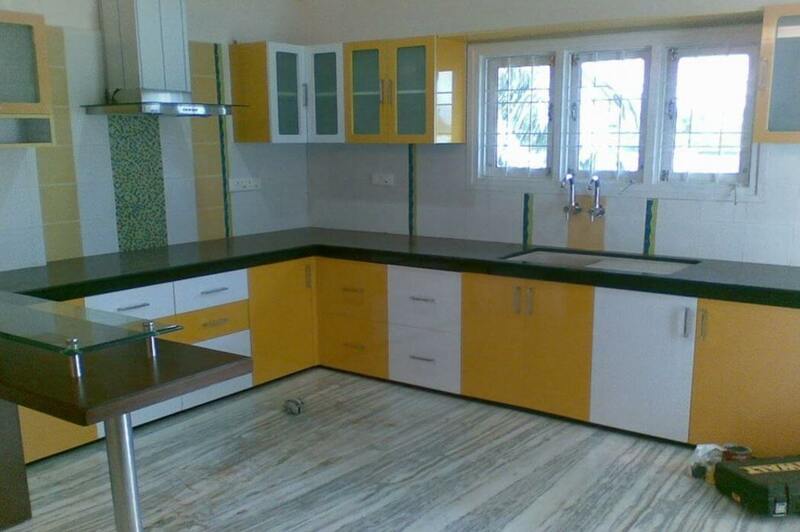 Check out this interesting colourful Indian kitchen design. It comes complete with all the modern amenities. 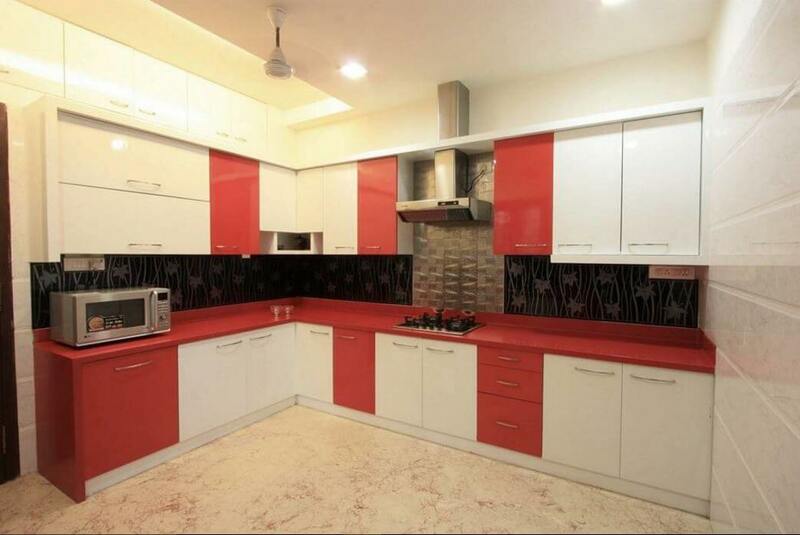 The red-white colour choice is awesome and I’m sure would make it the most loved part of the house. This Indian kitchen design with multi level storage capacity will certainly give an organised look to your home. 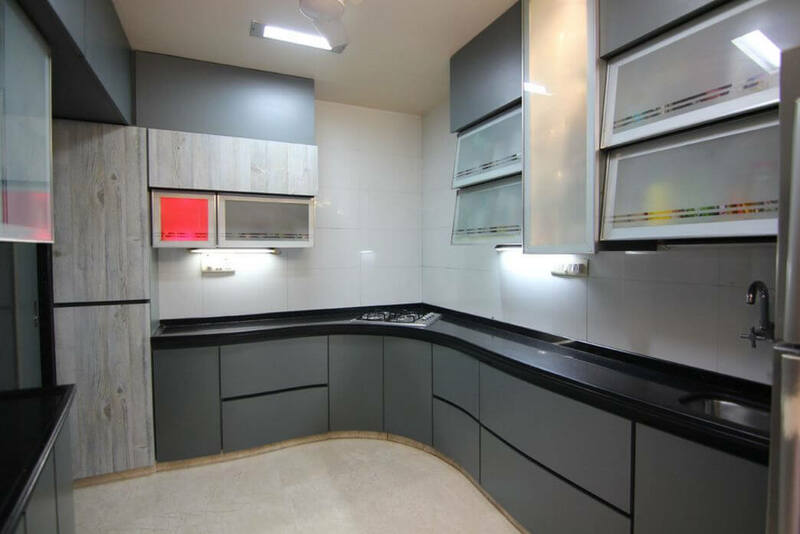 This is a neat smart-looking modular kitchen design, perfect for Indian homes. Extend the countertop at one end to create a nice breakfast nook. The kitchen has lots of overhead cabinets for storage. The cabinets under the countertop also succeed in serving the purpose. Use of green colour brings a whiff of freshness in there. This sleek U-shaped kitchen will definitely grab eyeballs. This seems to be a small kitchen area and the designer has smartly incorporated all the elements successfully. I like having windows in my kitchen and this one has a couple of them yearning to welcome the first rays of the sun. Here is an elegant modular kitchen! 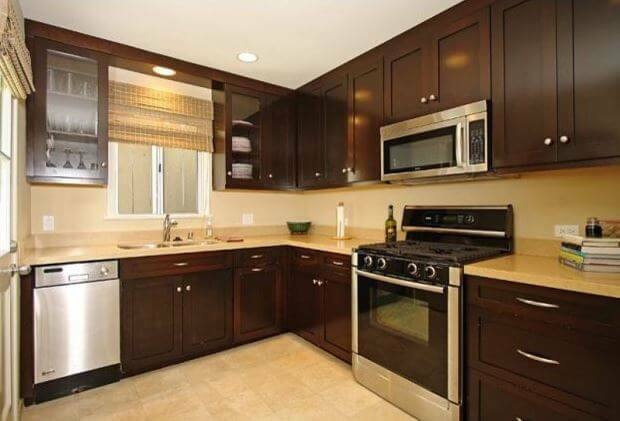 It has granite countertop and easy to maintain tiles backsplash. The cabinets are made from highest quality plywood, crowned with walnut veneer and coated with high gloss polyester polish. 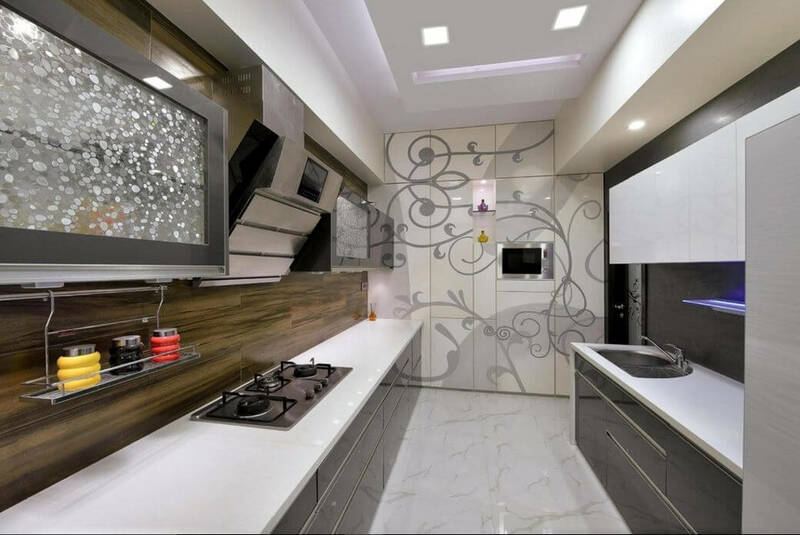 This Indian kitchen design is definitely going to motivate the lady of the house to prepare sumptuous and lip smacking cuisine. 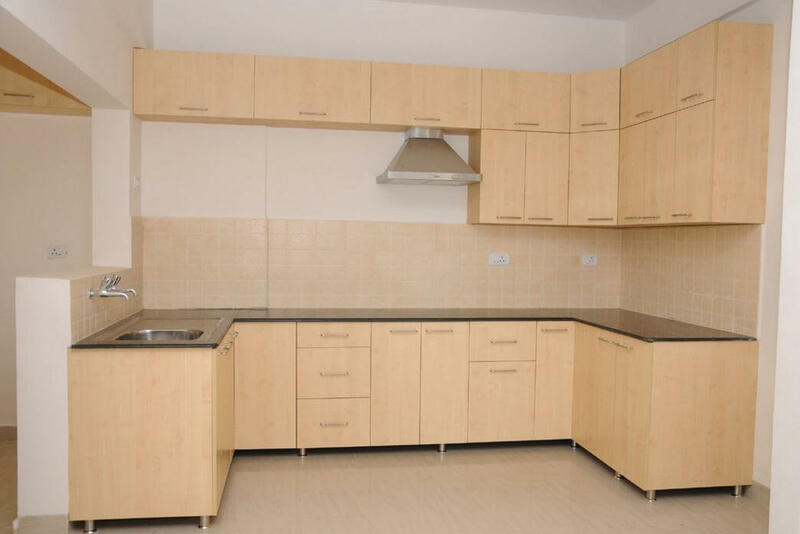 This kitchen is an example of a simple contemporary style Indian kitchen design. The beech wood cabinetry blends with the wall tiles and makes the interior look subtle. They offer good storage capacity and are ideal for an Indian household. This modern kitchen is done using neutral shades. The cabinets in dark chocolate goes well with the light coloured floor and ceiling. I like the idea of having window blinds instead of curtains as they are much safe. Always do the lighting arrangements keeping your needs and requirements in mind. The floor tiles and the countertop create an undertone and subtlety in the ambience. This Indian kitchen design is my colour palette! A splash of bright colours can cheer up any kitchen. 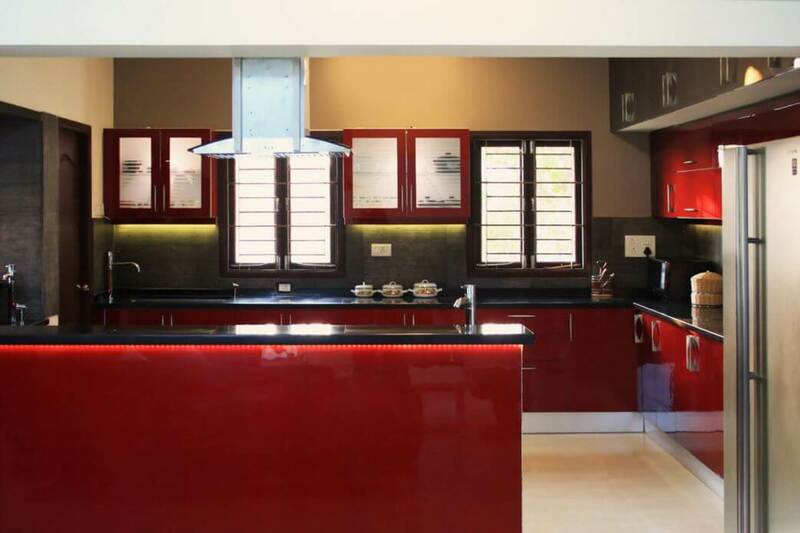 Choose a bright red colour to maintain the vibrancy of the atmosphere. Add under cabinet lights to add to its beauty and to keep it properly lit. This contemporary kitchen in grey and white looks sleek and smart. The cabinets with pull-up glass doors are extremely attractive. 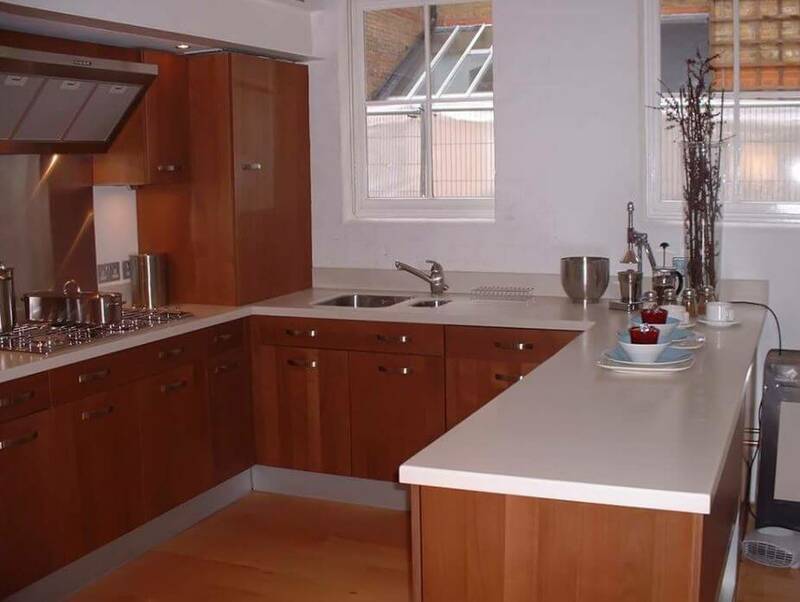 They are popular with modular kitchen designs these days. The stained glass cabinet doors hide what’s required and only gives a partial glimpse of the nitty-gritty kept inside. 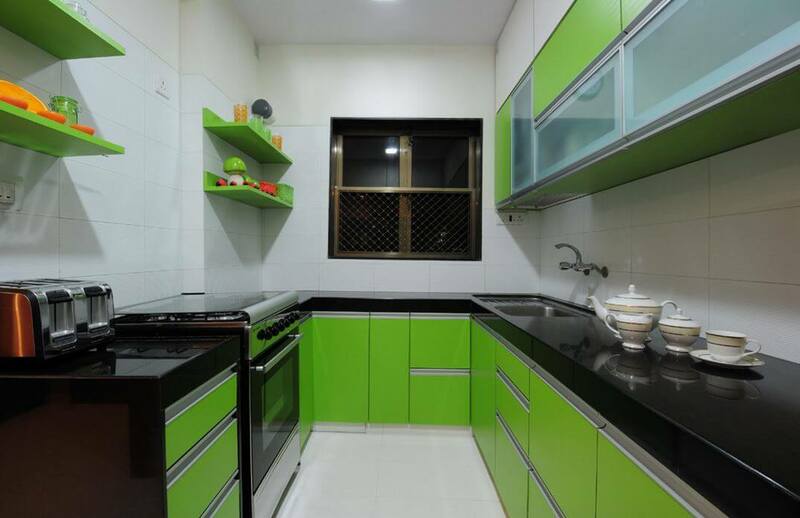 Green is associated with nature, renewal and youthfulness hence it is a fantastic choice for your kitchen. Stick to the hues found in the nature and you can never go wrong. The black granite used on the countertop looks very elegant. The green floating shelves and the overhead glass compartments add more . 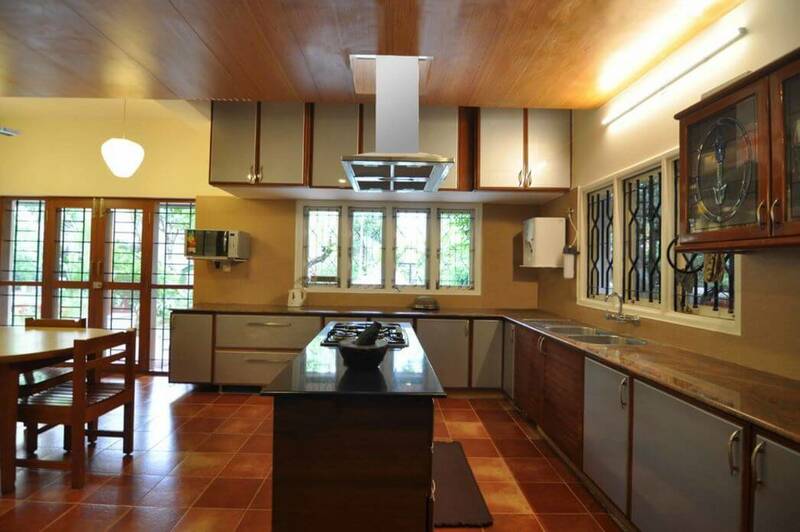 Here is one of the most popular Indian kitchen design. The cabinets in white and deep red offers nice storage capacity. The sliding window is instrumental in keeping the ambience clean and fresh. 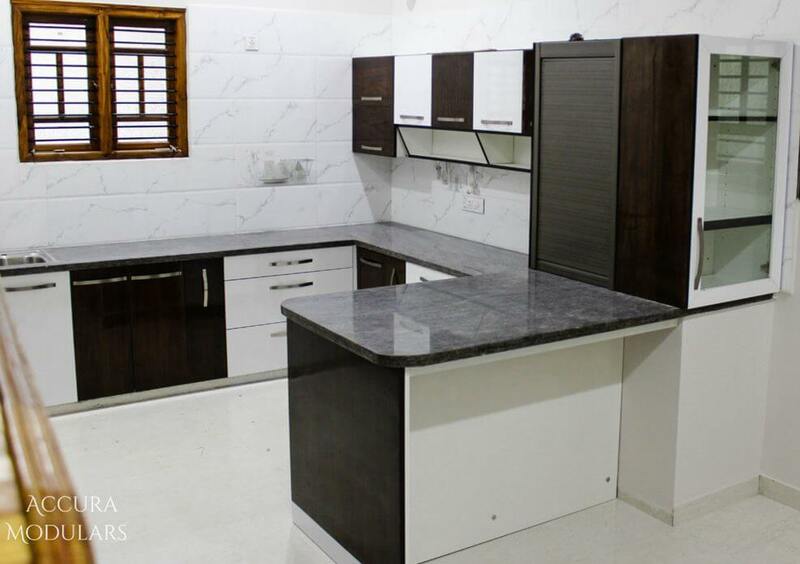 Contemporary modular kitchen like this one is perfect for apartments. I love the backsplash in zigzag pattern it looks very attractive. The exposed brick wall goes well with this modern concept. You can add a small dining area to the kitchen so it is easy for the lady of the house to cook and serve as well. The large window fills the kitchen with natural light and air. Check out the amazing size of this kitchen. It has ample work space and place to storing things. The colour choice of the drawers, cabinets and the tiles are lovely as they add warmth to the kitchen. Opt for granite countertop; they are available in many colours and give an elegant feel to the kitchen. ‘Meals and memory are made in the kitchen’, this huge kitchen area satisfies this adage. This Indian kitchen design is decked up with all the modern appliances along with mortar and pestle to keep the traditional cooking alive. Huge doors and windows allow the entry of light and air in abundance. The is a dining area looks quite welcoming and inviting, thus making the atmosphere more blissful. The concept of open kitchen is a rage these days. Open kitchen is more connected to the rest of the house. Working in this type of kitchen design can be fun. 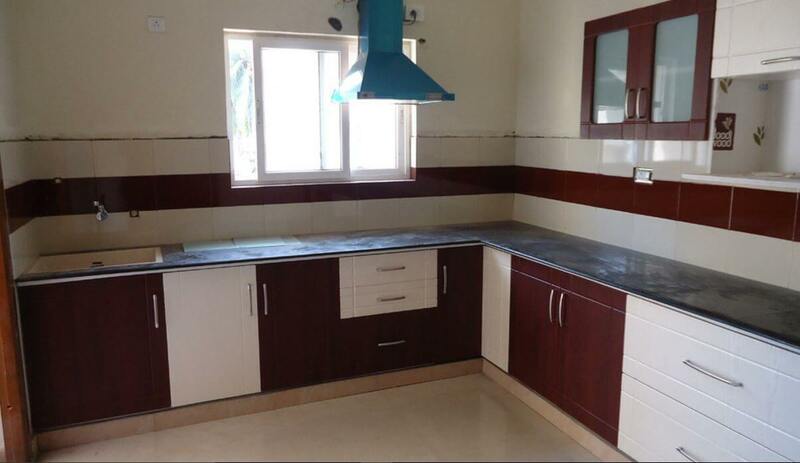 The person in the kitchen can cook delectable cuisines while enjoying the general conversation going on in the house. 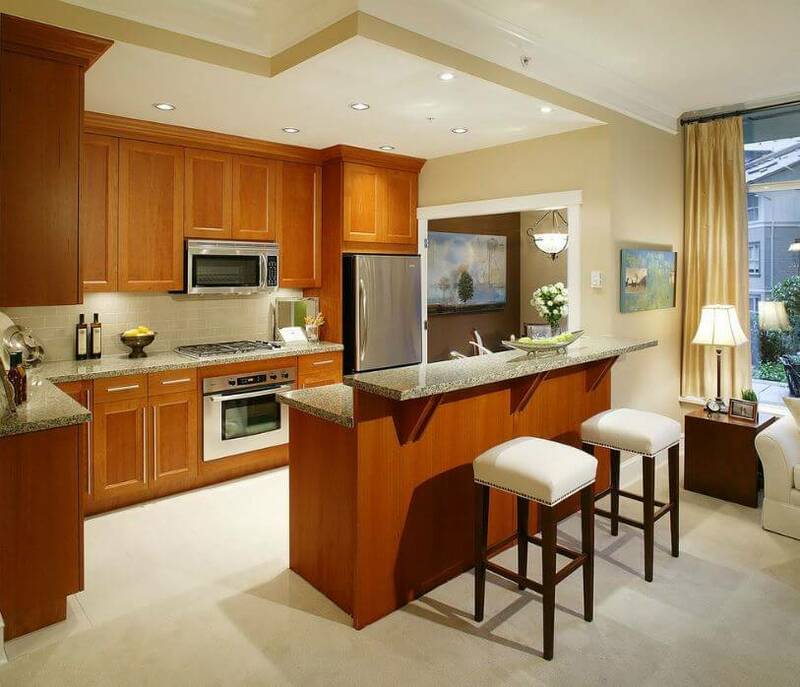 This kitchen looks very smart and the cabinets are sleek and enticing. This is a gorgeous Indian kitchen idea. Create a captivating accent wall or go for out-of-the-box cabinet designs like the ones here. The colour combination is very soothing and transforms from one to other with ease. This entry was posted in Kitchen, Kitchen Designs and tagged Contemporary Indian Kitchen Design, Indian Kitchen Design, Indian Kitchen Design Pictures, Indian Kitchen Designs, Indian Kitchen Designs for Small Kitchens, Indian Style Kitchen Design, Kitchen Cabinets, Kitchen Colors, Kitchen Design, Kitchen Design for Small Space, Kitchen Design Ideas, Kitchen Designs, Kitchen Designs for Indian Homes, Kitchen Designs for Small Kitchens, Kitchen Designs for Small Kitchens Gallery, Kitchen Designs Layouts, Kitchen Designs on a Budget, Kitchen Designs Photo Gallery, Kitchen Designs Photos, Modern Indian Kitchen Design, Modular Kitchen Designs and Photos, Modular Kitchen Designs for Small Kitchens, Modular Kitchen Designs for Small Kitchens Photos, Simple Indian Kitchen Design, Simple Kitchen Design, Simple Kitchen Designs for Small Kitchens, Small Indian Kitchen Design, Small Kitchen Design Ideas, Small Kitchen Designs, Traditional Indian Kitchen Design by Preeti Sinha. Bookmark the permalink.